The Al-Aqsa Mosque, originally constructed about 20 years after the nearby Dome of the Rock, is Jerusalem’s biggest mosque. Its spacious interior, divided by columns into seven aisles, allows room for more than 4000 Muslims to prostrate themselves on the carpeted floor during worship. Actually the whole area of the Temple Mount, known to Muslims as Haram esh-Sharif or the Noble Sanctuary, including all its minor domes, chapels and colonnades, is regarded as a mosque. It is Islam’s third holiest site (after Mecca and Medina). The whole compound contains more than 14 hectares of buildings, fountains, gardens and domes. It comprises nearly one-sixth of the walled Old City of Jerusalem and can accommodate hundreds of thousands of worshippers. 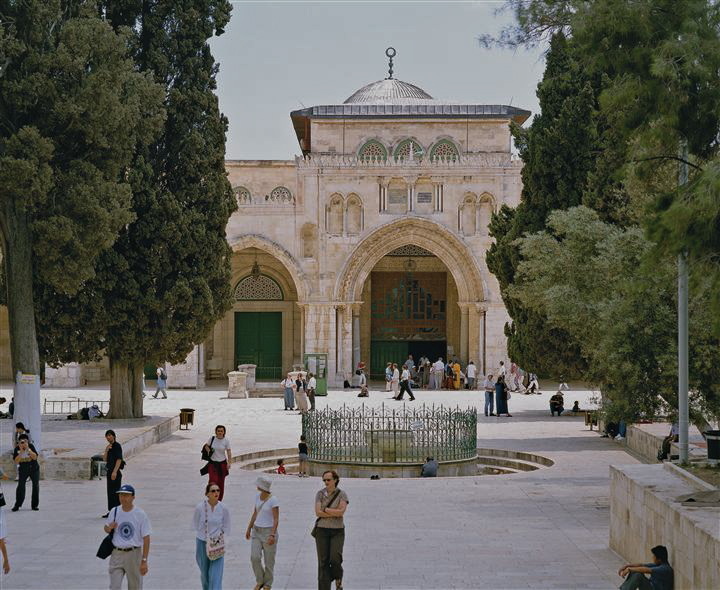 The name Al-Aqsa Mosque (also spelt El-Aksa) translates to “the farthest mosque”, a description relating to Muhammad’s Night Journey from Mecca to Jerusalem and back. 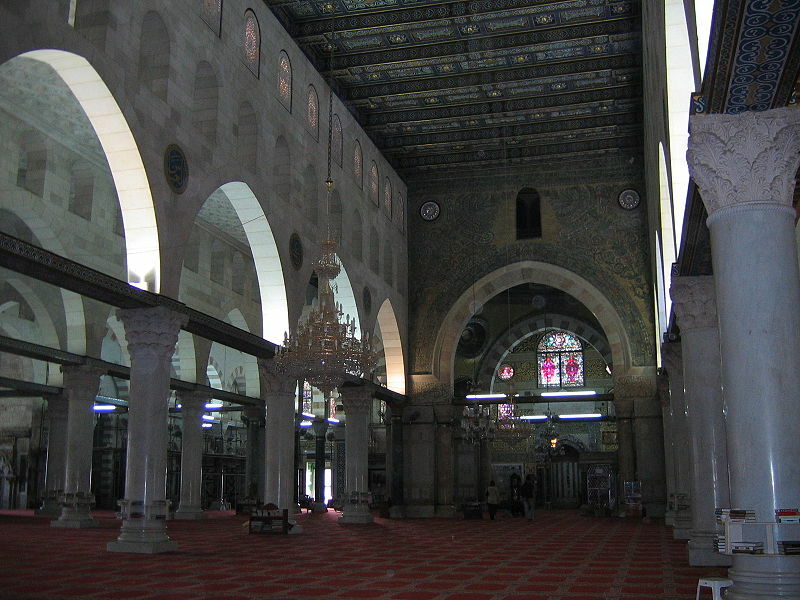 The mosque building was begun in the early 8th century and has been reconstructed many times. The lead-covered dome dates from the 11th century. The Temple Mount is the site of the first Jewish Temple, built by Solomon. It is also the location of a 6th-century Christian church dedicated to the Virgin Mary, which was burned by the Persians in 614. The original mosque possibly converted the remains of this church. During the 12th century the Crusaders used the mosque first as their royal palace, then as the headquarters of the new Knights Templar. One of the mosque’s many rooms still has the medieval rose window it had when it was a Crusader chapel. The vast hall, 82 metres by 55 metres, has seven rows of columns (donated by the Italian dictator Benito Mussolini during a 20th-century restoration). Behind the minbar or pulpit is a rock, originally in the Dome of the Ascension, which supposedly bears the left footprint of Jesus. The southern wall, one of the few remnants of the original mosque, has a mihrab (niche) oriented towards Mecca, Islam’s holy city. Near the mihrab is a small mosque, known as the Mosque of Omar (a name that is also erroneously given to the nearby Dome of the Rock). Under the mosque is a large subterranean hall. It leads to one of the original entrance passages to the Temple Mount during the period of the Second Temple. In the courtyard on the extreme south-west is a large building, formerly known as the Mosque of the Moors, which contains the Islamic Museum. 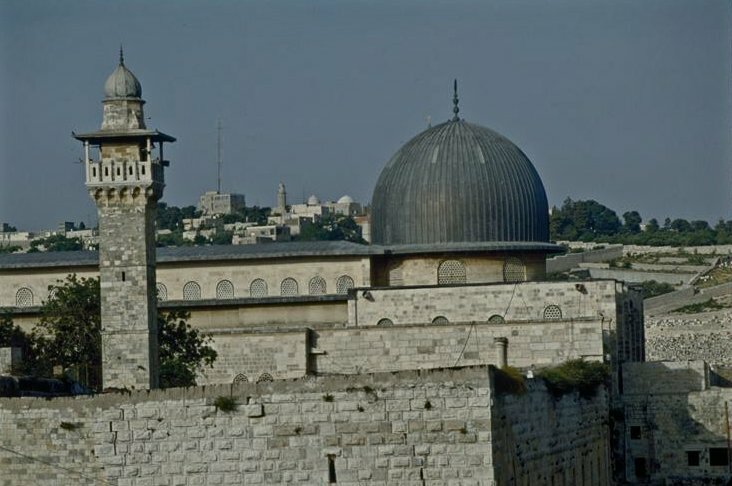 In 1969 an Australian tourist, Michael Dennis Rohan, attempted to burn the Al-Aqsa Mosque. The fire gutted the south-eastern wing, destroying a 1000-year-old pulpit given by the 12th-century sultan Saladin. Rohan, a member of an evangelical Protestant sect, said he hoped to hasten the coming of the Messiah by having the Jewish Temple rebuilt on the site. He was found to be insane and deported. Open: Non-Muslims are permitted to enter the Temple Mount through the Bab Al-Maghariba (Moors’ Gate), reached through a covered walkway from the Western Wall plaza, during restricted hours. These are usually 7.30-11am and 1.30-2.30pm (closed Fridays and on religious holidays), but can change. Modest dress is required. Non-Muslims are not normally allowed into the Al Aqsa Mosque or Dome of the Rock. Non-Muslim prayer on the Temple Mount is not permitted. Inman, Nick, and McDonald, Ferdie (eds): Jerusalem & the Holy Land (Eyewitness Travel Guide, Dorling Kindersley, 2007). Fortescue, Adrian: “Jerusalem (AD 71-1099)”, The Catholic Encyclopedia (Robert Appleton Company, 1910).